Hi I’m Eva and I have a birthday coming up very soon. July 13th to be exact. My birthday wish this year and for the past six years is to have my very own family where I am loved for just being a member of the family and not having to keep having litters of puppies. Pug Partners of NE rescued me from a puppy mill. Do you notice anything about me that is a bit different? Well I’ve been told all my paperwork says I’m 100% pug but my foster mom thinks someone was fooling someone else on this. But since my paperwork says it is so, it must be true right? I had many litters of puppies and they were all sold as pugs. Hmm might give you another reason to question where the puppy you are purchasing comes from if you can’t see the mommy and daddy together. Just a thought. 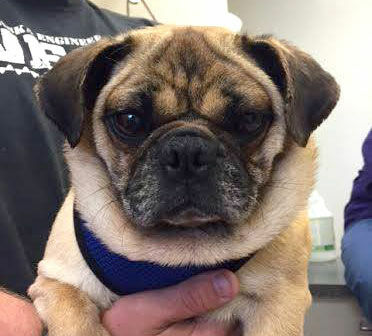 The nice people at Pug Partners of Nebraska rescued me and I’m learning how to trust and be part of a family. I love being around other dogs my size as they comfort me and are teaching me how to be a pet and to trust people. I also like to follow my foster mom wherever she goes. I don’t mind cats either, as long as they leave me alone, I ignore them. I am scared of many things right now but my foster mom says I’m making progress each and every day. I’m scared of loud noises and these fireworks I’ve been hearing are really scary! I’m beginning to come to my foster mom when she calls me and I let her pet me. I like to be petted but she says hands must not have always been nice to me because I tense up when being petted as I’m afraid I might get hurt. My foster mom is patient and she keeps petting me when I’m on her lap and I finally will begin to relax and I’ll take a nap on her with my foster sisters. One of my favorite things to do is run around outside in the yard. It is so much fun to have grass under my paws and room to just run and explore. The perfect home for me would be a quieter one with no small children since I’m still so scared of new things. I definitely want a fenced in yard to run and play in with another pug or dog my size to hang out with. I would like adults that are very patient and kind and realize that it may take me time to trust you but I’m worth it as I’m told daily. Interested in adopting? Eva’s minimum adoption donation is $275.